On behalf of Chinmaya Mission Chicago and Chinmaya Yuva Kendra we would like to invite you to register for our 3rd annual one day camp just for high school students (JCHYKs)! The theme of the camp is “Storm to Perform,” based on a book by the same title written by Pujya Swami Swaroopanandaji. This will be a wonderful opportunity for our high school students to learn from Smt. 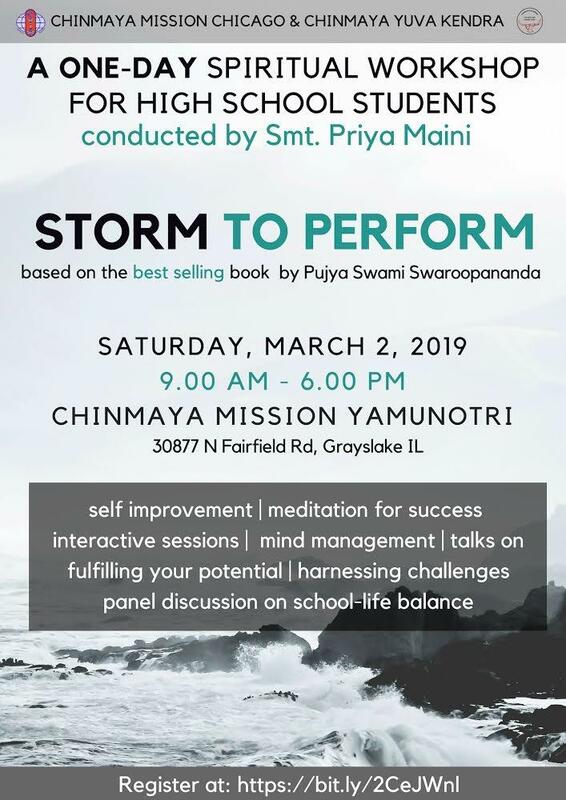 Priya Kumar from Chinmaya Mission Somnath (Washington DC) about how to face “storms,” or obstacles in life and how to overcome them in order to reach our infinite potential! This will also be a great time to get to know local CHYKs and fellow JCHYKs. Note: For students who attend Balvihar on Saturday or Sunday, you will attend the camp instead of regular class. -Meeting and hanging out with your peers! *The panel discussion will start at 4:30 pm. High school parents and 8th grade students are invited to attend. It will feature professionals from several distinct career paths/fields who will help guide students to manage their academic pursuits in a balanced and strategic way. Please feel free to come with questions for the panelists!